Casa Tejon is a townhouse measuring 1000 m2, restored respecting its original construction and the principles of traditional architecture of Mijas. Situated in the very heart of Mijas, it is the ideal starting point of many routes: on one side, you will discover our coast and beaches, and on the other the mountains, while taking in the stunning views offered by Mijas and its surroundings. We have five apartments suitable for two or three guests. Each of them consists of a bedroom with a double bed, bathroom, living room and a fully equipped kitchen. We will change the linen every three days. 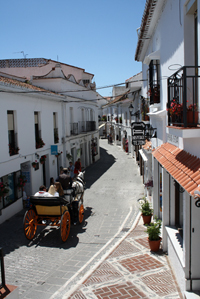 The village of Mijas has a history dating back to Roman times, when it was known under the name Tamisa. It was conquered by Muslims in 714 and reconquered by Christians in 1487. Mijas lies only 30 kilometers from the capital of the Costa del Sol, bordering South - West with Marbella, on the North with Alhaurin el Grande, on the East with Benalmadena and on the South with Fuengirola. It is due to this geographical location that Mijas is considered the most centrally located village, with an equal distance to the most important municipalities that make up the Costa del Sol.